Cyrus Kurtz Holliday did more to build and define Topeka than any other individual in its history. He was among the nine signers of the original city charter. Through his political activities he influenced the state constitutional convention to locate the capital at Topeka and even outlined the plans for construction of the Statehouse. And he started the Atchison, Topeka & Santa Fe Railway, which was the city’s economic lifeblood for decades. Holliday was born at Carlisle, Pa., April 3, 1826, and studied the law at Allegheny College in Meadville, Pa. He chose a career in business, though, and his first venture was a short line of railroad in his native state. Despite reports he brought $20,000 from that venture with him to Kansas, he likely entered the new territory with much less. He and Mary Dillon Jones were married in 1854, and soon after Holliday was on his way west. He wrote regularly to Mary, extolling the virtues of the Kansas Territory and his free-stater brethren. He also mentioned the hardships – his bed was a buffalo robe and two blankets. In one letter, he told his wife he was writing to her with the last ink in town. But he was convinced his best future lay in Topeka. Shortly after his arrival, he wrote to Mary, “I have found the very best of people in Kansas. I am becoming more and more pleased with them every day, and I know you would like them and the place were you here.” In later correspondence he talked of his good health and that he was gaining weight. 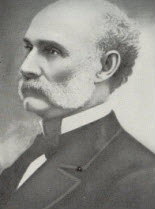 He was active in the efforts to see Kansas admitted to the Union with a constitution that prohibited slavery. That meant confrontations with large bands of Missourians who were trying to influence events in Kansas. In the first territorial election, Holliday noted there were 400 to 500 Missourians milling about, while Topeka had fewer than 100 residents. When all the votes were counted, there were more ballots cast than Kansas had residents. The plague from Missouri also disrupted supplies, so Holliday and his fellows would raid nearby pro-slave settlements – Tecumseh, Indianola, Oskaloosa – for food and other necessities. War put on hold Holliday’s plans to build his railroad, though he incorporated and capitalized it in 1860. While battles raged, there was no way to obtain the federal land grants he needed to lay track. As soon as the war ended, a hostile takeover wrested control of the company from him. It took nearly three years of effort and the assistance of prominent Kansans, including the governor, to put the AT&SF back in its founder’s control. He remained a director until his death in 1900. For decades following, the Santa Fe was Topeka’s largest employer. The company’s economic presence today, as Burlington Northern Santa Fe, remains substantial. Holliday had an active public and political career: leader of the Topeka Town Association, elected state senator in 1861, served as adjutant ­general during the Civil war, elected to the state House in 1866, and was nominated for Congress in 1874 (defeated). His business interests included being president of the Excelsior Coke and Gas Co. and the Merchants National Bank of Topeka. He was a president of the State Historical Society. Holliday’s family plot in Section 8 contains 20 grave spaces, but many remain empty and the property of his heirs. With Holliday are his wife, Mary; his mother, Mary Kennedy Holliday, born in 1791; his daughter and son-in-law, Lillie and Thomas Kellam; a grandson, Kurtz Holliday; and Rebecca Holliday, relationship unknown.